The Girls Friendly Society was started in 1875 by Mary Elizabeth Townsend. She was an Irish clergyman's daughter and had concerns about young girls who were working away from home and possibly in a vulnerable situation. The girls would be the Society "Members" and were to be guided by the Society "Associates" ( life experienced ladies ), who would provide a friendly and social environment for the members benefit. The society had a strong religious ethos and grew quickly, having some 40,000 Members by 1880 and over 13,500 Associates. In that year also Queen Victoria became the society's Patron. 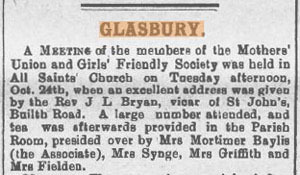 It is worth noting that the girls recruited at this time would be aged 12 upwards and that by 1882 girls of 8 year old could become Candidates (aspirant Members). By 1900 domestic service comprised the largest group among the Members, others being teachers, nurses, clerks, workers in refreshment bars, mills, factories, warehouses and also students. 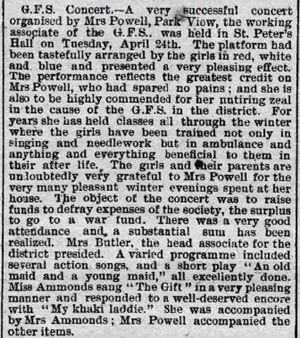 One of the society's biggest benefits was the introduction of their Lodges, which provided decent, clean and cheap accommodation for the young women workers and no doubt a strong social function, offering personal friendships, group activities and useful contacts as regards the work itself. 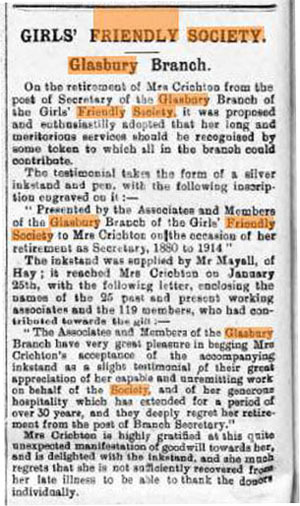 Numerous publications were introduced on an informative basis, the first being "The Girls' Friendly Society Reporter in 1875", followed by "Friendly Leaves". Pamphlets and books were also produced explaining the overarching ethos of the GFS movement. After the First World War many jobs were lost and numbers were in decline. The Society bought Argyll House to provide for homeless girls and women fleeing from domestic violence. It also expanded its remit to provide training courses in Correspondence and English and helped with members visits abroad. Camps were introduced and a Central Council for Recreative Physical Training was established. Today the GFS is still ongoing under the aegis of the GFS Platform and has 33 branches in the UK but now needs only one housing complex in Gt Yarmouth - a supported-shared house for young mothers. The Society still promotes sound Christian values along with friendship, social skills and understanding amongst young women of all ethnicities. 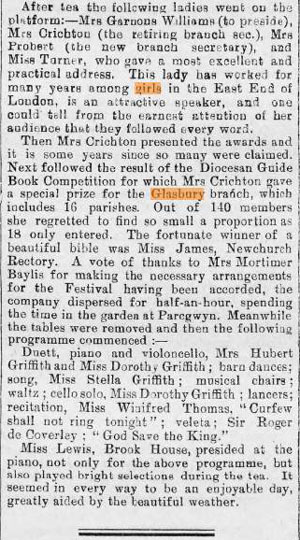 The Branch emanated from Brecon Cathedral and despite it's name (Glasbury) covered an unusually large area, comprising the following Parishes at the 1914 Annual Festival at Gwernyfed : - Boughrood, Bryngwyn, Clyro, Crickadarn, Glasbury (All Saints and St Peters), Hay, Llanigon, Llanstephan, Llowes, Llyswen, Newchurch and Talgarth -some 13 in all - see article on right. In the previous 1913 Festival there is mention of 16 Parishes, although none of these are named - see article below right This leaves us with the anomaly of three parishes unaccounted for and is possibly a misprint in the 1913 report ? or a fact that only 13 parishes turned out for the 1914 Annual Festival. ? The latter seems the more unlikely. 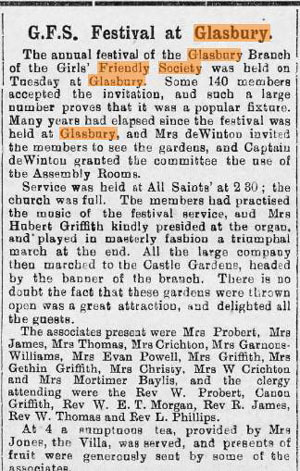 From the press cuttings it appears the Glasbury All Saints and Glasbury St Peters functioned as independent sections of the Glasbury village. They sometimes came together at a local level and sometimes when combining with parishes outside the village. 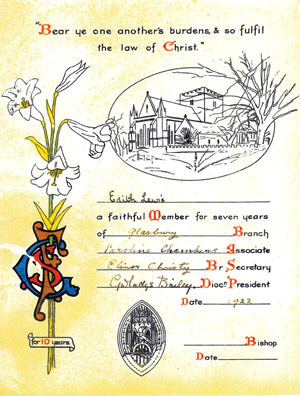 Annual certificates (cards) and long service ones were issued by the Branch Secretary - example above right , and also a "Saving Bonus" prize; as yet unidentified as to its nature. 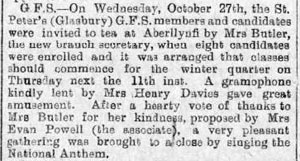 The Head Associate for the district was Mrs Butler of Aberllynfi, a formidable women of great drive, influence and initiative. She also had a strong and lasting community spirit. 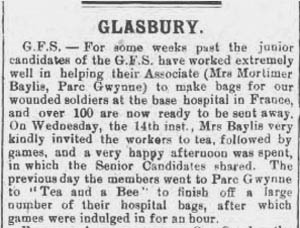 Other associates for the Glasbury (All Saints and St Peters) area mentioned in the 1913 article were as follows : - Mrs Christy, Mrs Crichton, Mrs W Crichton, Mrs Evan Powell, Mrs Garnons Williams, Mrs Gethin Griffiths, Mrs Griffiths, Mrs James, Mrs Mortimer Baylis, Mrs Thomas and Mrs Probert. The new Brach Secretary was to be Mrs Probert.